It seems like the team of Bangkok.com or Bangkok magazine has repeatedly been asked on the best tailors in Bangkok . Which we believe prompted them to approach us. One of the editor came to down to our store and purchase a suit and some dress shirts. The next moment we know we are being interviewed by Bangkok’s leading magazine. 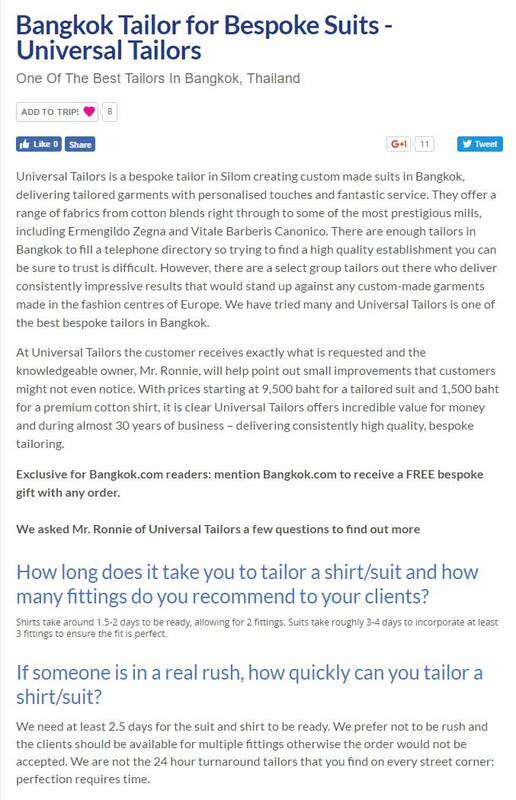 The editorial claim UNIVERSAL TAILORS as the best bespoke suit tailor in Bangkok. Guess, they were bowled over by obsession for quality and high end workmanship. We must say, the editor was a bit fussy and he got the best out of us. Bangkok Magazine is the ultimate Bangkok city guide. Bangkok Magazine brings the openings, weird and wonderful attractions and reveals on places that locals want to keep secret. It’s guaranteed site to make sure that the travelers experience is out of the ordinary. The site is highly popular among expats that is trying to get a hold of the city and the travelers finding the best restaurants and shopping arenas. Its featured stories is a must read. This can be considered one of our most prolific feature ever. Business Traveller magazine approached us to be featured us on “ Satorial Jorney” article. They stress on the point that Asia is renowed for sharp tailoring at reasonable prices and wanted to get insights from tailors to guide on the cut, style and fabric.